Tunisee Camping si trova a Hochdorf, Baden-Württemberg, è situato a un lago. Questo campeggio dispone di piazzole delimitate, sia ombreggiate che, senza ombra e piazzole poco ombreggiate. È possibile affittare roulotte, casemobili e chalet. Il campeggio dispone di un parco giochi e di un campo sportivo. Per gli sportivi, il campeggio prevede diversi percorsi in bicicletta. Nelle immediate vicinanze potete fare il bagno nel lago. Al campeggio Tunisee Camping è possibile praticare snorkeling, windsurf e sci d'acqua. Ogni anno un ispettore visita il Tunisee Camping, controllando oltre 200 tra attrezzature e altri punti di interesse del campeggio. L'ispettore è un dipendente ACSI e non lavora per il campeggio. Staff intimidating, rude. Pitch a long way from toilet block (site half empty but didn't get any choice) and it's the first time having been to many European campsites I've been charged a lot extra for electricity for just three nights stay! A site with good facilities but spoiled because of the rude staff (just the two women on reception) and its rip-off charges. Will NOT be returning. we camped for one night at Camping Tunisee, we are expats from New zealand living in Switzland. We have never come across such a rude camp manager as we did at this camp site. We left 10mins after the 1pm to 3pm quiet time and were told we were not allowed out of the campsite!! I have never come across this any any campsite I have ever stayed in and I have stayed in alot. The Camp manager was called via phone and as soon as I took the call she started to yell at me. It took me to argue back to get us out of that place and we were only allowed out if we swore we would never return....way to run a business!! I am still reeling from this experience two days on. We were respectful campers, quiet, no anti soical behaviour and to be treated like that for being 10mins late out the door is so disgusting. She doesn't have to worry we will never set foot back into that place again. Stayed for one night in June - would have been longer but the only way to describe the site is that it was very over crowded. We, and several others ended-up piched on the sports field. Also, hardly any water taps which on a site as big as this is a big problem. Not sure how it ever got in the Acsi book! Yet again site has surpassed our expectations. Last visited 2 years before, they still remembered us. Excellent facilities, well managed and controlled. Easy access to walking and nearby village, good bus - tram link throgh to Freiburg. Able to park car and not use it for the full 2 weeks we were there. Fresh bread each morning a delight. 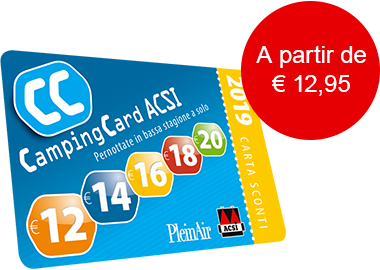 ACSI Eurocampings invia la tua richiesta di informazioni al "Tunisee Camping".